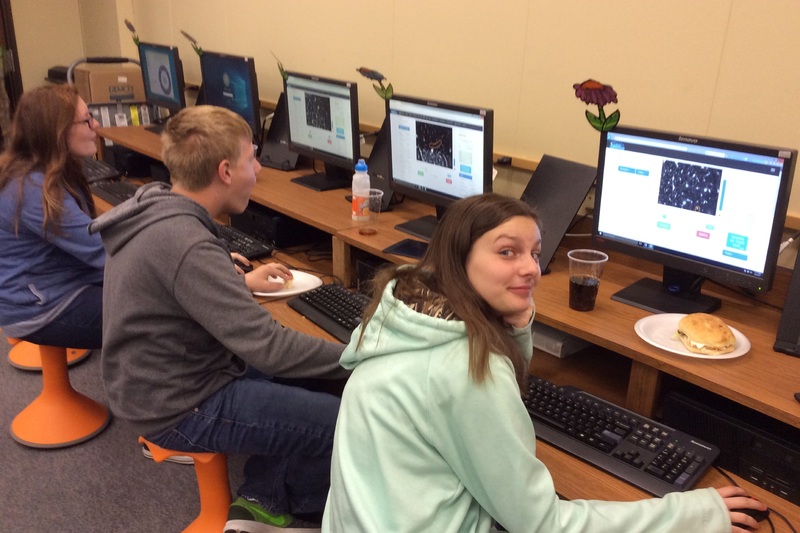 Stall Catchers is an online game that anyone can play - no experience necessary. In the game, you look at movies from the brains of mice and try to identify vessels as flowing or stalled. This helps to speed up Alzheimer's disease research at Cornell University. Stall Catchers is part of the EyesOnALZ project. 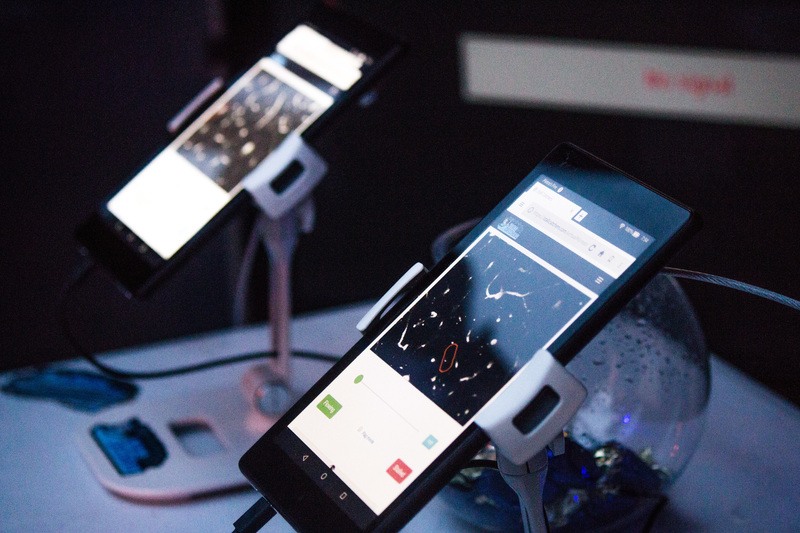 The game was built on one of the oldest volunteer thinking projects: stardust@home, and is using the Virtual Microscope developed by their team. Who knew stardust and blood vessels could be so similar? Anyone can be a catcher! Currently, our catchers range from 6 to 88 years old. Large part of our community includes middle school students, seniors, caregivers and Alzheimer’s patients themselves. The game is easy to grasp, and we walk you through in the beginning. Check out the "How to" section in the main menu if you need help at any time. 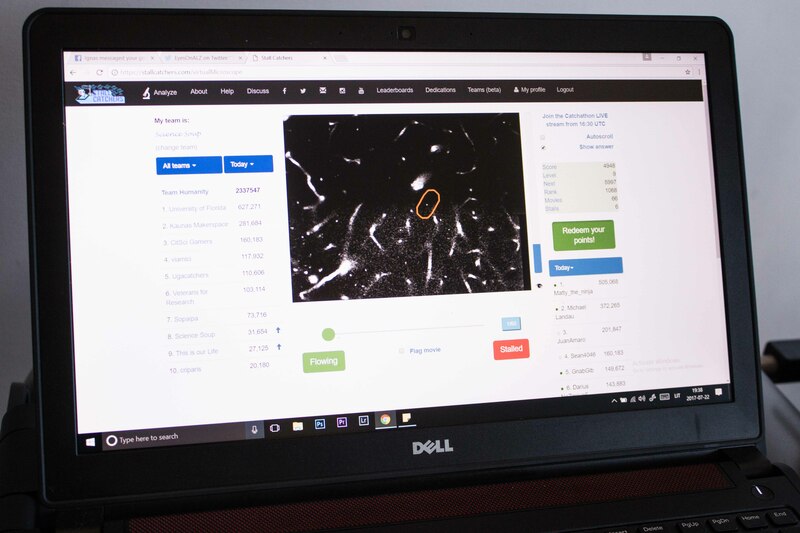 Don't worry about making mistakes - each blood vessel is analysed by multiple catchers, and we ensure we generate reliable crowd answers in the end. EyesOnALZ is a citizen science project developed by the Human Computation Institute. The project enables everyone to contribute to Alzheimer’s disease research and speed up the search for a treatment. 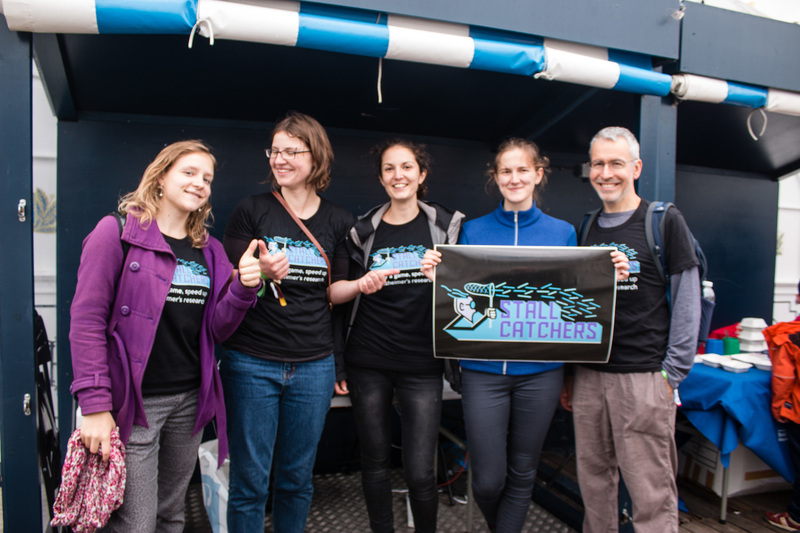 Our first citizen science game - Stall Catchers - was launched in October 2016 and now gathers thousands of volunteers. The idea was born in 2015, when by a lucky coincidence, Pietro Michelucci met Chris Schaffer, whose lab was in need of citizen scientists’ help. The project was funded by the BrightFocus Foundation and officially began in early 2016. EyesOnALZ includes collaborators from the Schaffer-Nishimura Lab at Cornell University, stardust@home team at U.C. Berkeley and SciStarter.com. Previous collaborators include Sebastian Seung’s Laboratory at Princeton University, WiredDifferently and others. Stall Catchers is the main activity of EyesOnALZ, but that’s not all we do! Check out the "Science" section, as well as our blog, community forum and social media channels to learn more. EyesOnALZ is supported by the BrightFocus foundation and its generous donors. Learn more about their Alzheimer's Disease Research Program here. Find the most recent "The Science of Stall Catchers" content on our blog here. Ask your questions and see other science discussions on our forum here. It has long been known that reduced blood flow in the brain is associated with Alzheimer’s disease and other forms of dementia, but until recently no one knew why. 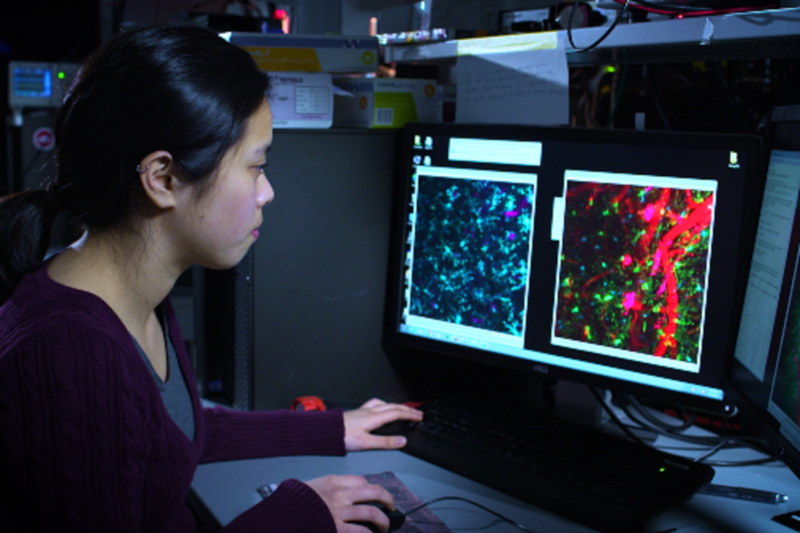 New imaging techniques have enabled our collaborators at Schaffer – Nishimura Lab to study the possible mechanisms that underlie this reduced blood flow in mice that have Alzheimer’s disease. Blood vessels appear to clog by white blood cells, causing a stall. In Alzheimer's, up to 2% of brain capillaries can be stalled, which can add up to ~30% reduced blood flow in the brain. That's the equivalent of the oxygen “debt” you experience when you stand up too quickly. Reduced blood flow does not only deprive the brain of nutrients and oxygen, but might also increase accumulation of harmful molecules. Such as amyloid beta proteins which, in excess, start to form amyloid plaques - one of the likely culprits of Alzheimer's disease. Besides damage to neurons, amyloid plaques also seem to induce inflammation, which attracts more white blood cells to brain blood vessels and causes more stalls! To test this and other hypotheses related to Alzheimer's disease and stalls, there's still lots of data to be analyzed. But since data analysis is so time-consuming, and no computer algorithm can do this job as well as humans for now, it could take decades to find treatment targets. With the help of citizen scientists in Stall Catchers we could do the same in just a couple of years. 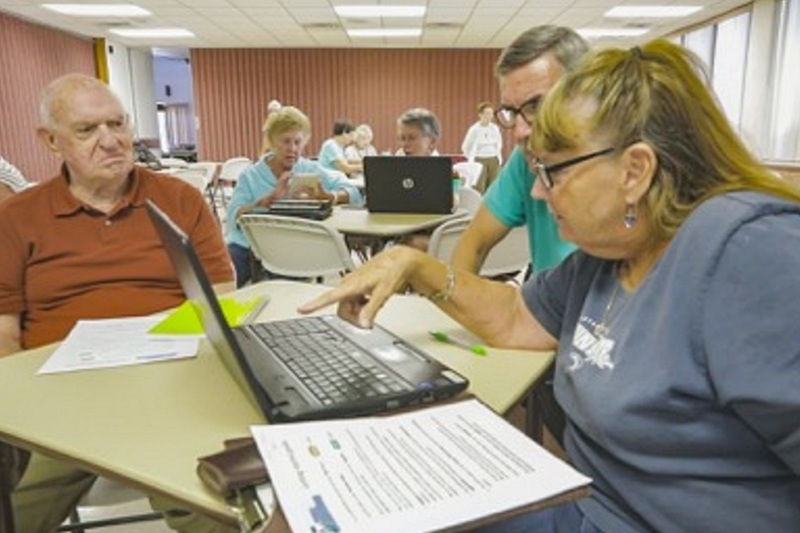 What do stalls have to do with Alzheimer's disease? We don't have the full picture yet. But we do know that about 2% of these capillaries are stalled in the brain of Alzheimer's patients, which causes a 30% overall reduction in brain blood flow. That's the equivalent of the oxygen “debt” you experience when you stand up too quickly. Our collaborators at Cornell have also been able to reverse stalls, which led to improved memory and reduced other Alzheimer's symptoms in mice. That's all very promising research, but a lot of questions remain to be answered. 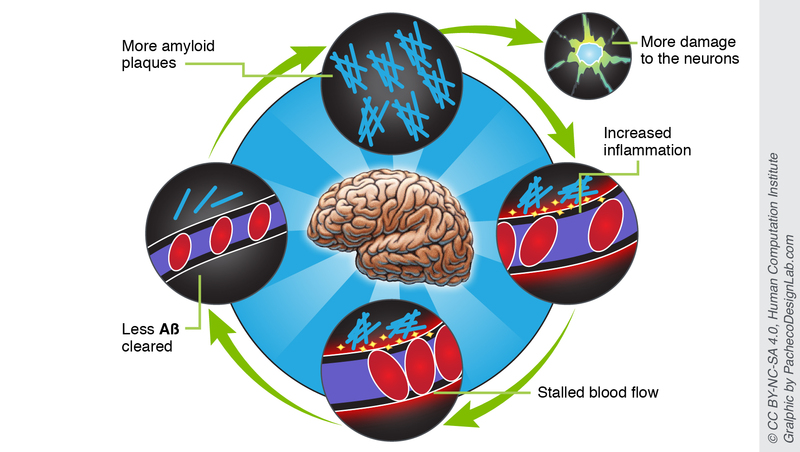 Reduced blood flow not only deprives the brain of nutrients and oxygen, but could lead to accumulation of amyloid beta. In excess, this protein forms the characteristic plaques that are implicated in Alzheimer’s disease. Besides damaging neurons, amyloid plaques seem to induce inflammation, which attracts more white blood cells to brain blood vessels, thereby causing even more stalls! How does knowing where stalls occur help the research? By knowing which vessels get stalled in the brain of mice that have Alzheimer's, we can find out answers to a range of questions, including whether stalls tend to reoccur in the same vessels or brain areas, do they occur more in certain diets etc. By counting the stalls before and after certain treatments, we can find out if any of them would be effective in treating Alzheimer's. In fact, that's how Cornell university have already been able to observe cognitive improvement in mice where the number of stalls was reduced. To test this and other hypotheses related to identifying an Alzheimer’s treatment, there's still a lot of data to be analyzed. But the data analysis is extremely time-consuming and beyond the reach of today’s best computer algorithms. It could take decades to find a viable drug target if the researchers work on it on their own. With the help of citizen scientists playing Stall Catchers, we could reduce this analysis time to just a couple of years! 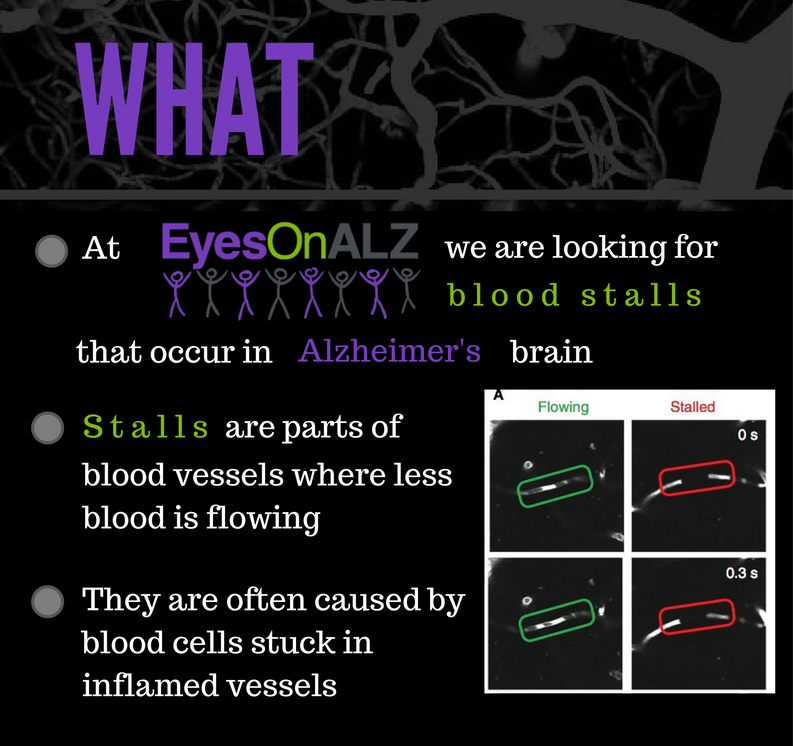 EyesOnALZ is a citizen science project crowdsourcing Alzheimer’s disease research. 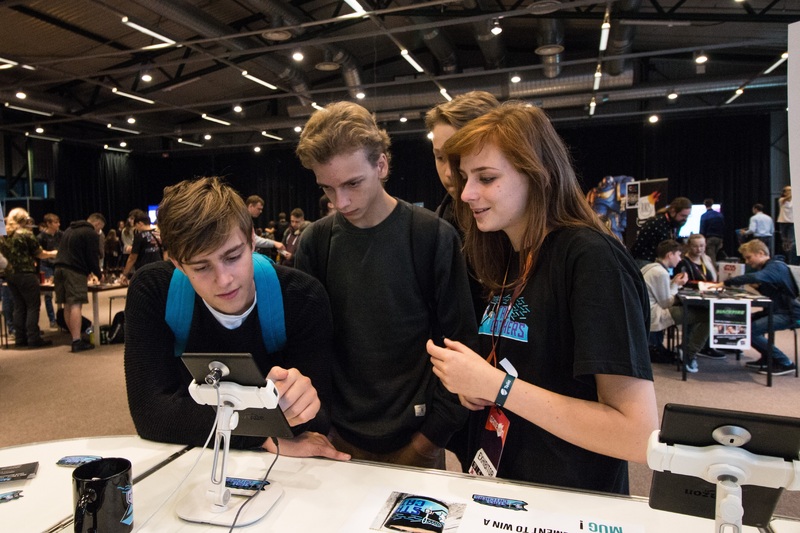 Stall Catchers is the first game and the main activity of the project. See the EyesOnALZ and Stall Catchers sections to learn more. EyesOnALZ and Stall Catchers are being developed by the Human Computation Institute (humancomputation.org). The project includes collaborators and advisors from the Schaffer-Nishimura Lab at Cornell University, stardust@home team at U.C. Berkeley, SciStarter.com, and elsewhere. See the Team section to learn about all the people involved. It has long been known that reduced blood flow in the brain is associated with Alzheimer’s disease and other forms of dementia. 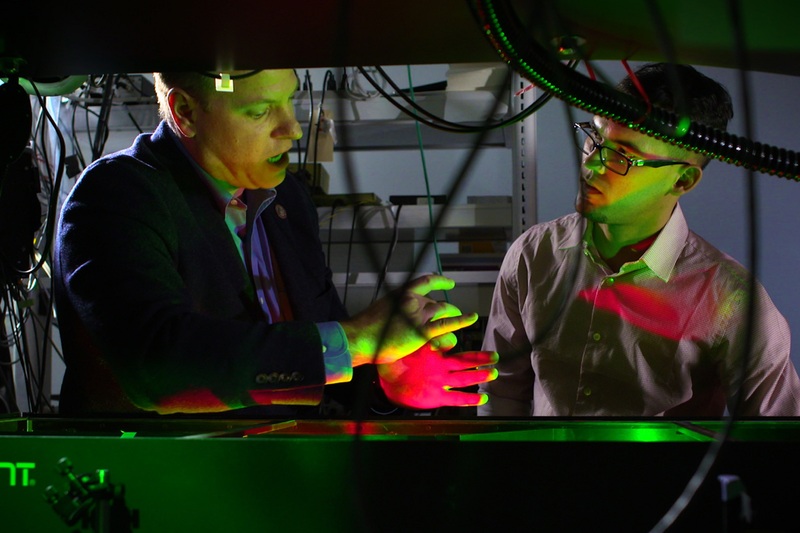 However, new imaging techniques have only recently enabled our collaborators at the Schaffer-Nishimura Lab (Cornell University) to look at this phenomenon in-depth. Among other discoveries, the Schaffer-Nishimura Lab have demonstrated that stalls might be responsible for progression of Alzheimer's. 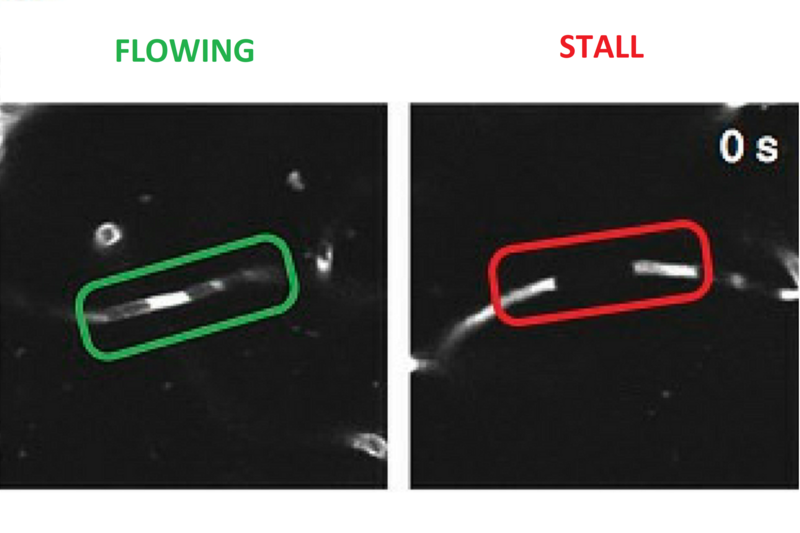 Meanwhile, reversing stalls in mice reduces Alzheimer’s symptoms, such as cognitive decline and mood changes. To get to the bottom of this process and discover effective treatment targets for humans there is a lot more work to be done. The manual data curation is so time consuming that it could take decades for the researchers to do alone. See the Science section to learn more. Stall Catchers allows everyone to contribute to the research being done at Cornell University. By watching "vessel movies" and identifying whether vessels are flowing or stalled, volunteers are speeding up data analysis by orders of magnitude. 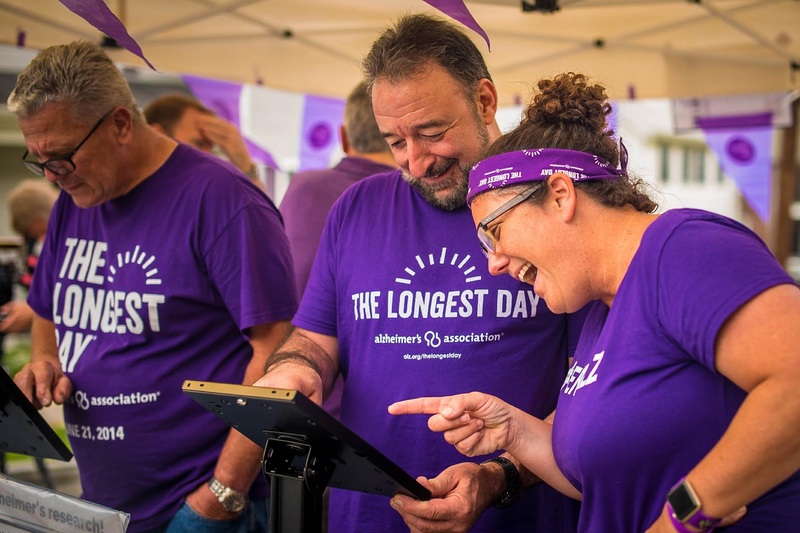 See this video playlist to learn more about how volunteer effort is pushing this research forward. Gallery of Stall Catchers photos, screenshots, and infographics. All content may be freely reproduced (CC BY-SA 4.0). In a year since the game launched, Stall Catchers players have already doubled the speed of Cornell's data analysis, potentially shortening the number of years to find a treatment for Alzheimer's from 30 years to 15. Once our community grows to 30,000 players, this will be further reduced to just 2 or 3 years. Photo gallery: Stall Catchers for everyone, everywhere! Find more pictures in our press bundle. All content may be freely reproduced (CC BY-SA 4.0). Stall Catchers is a project by the Human Computation Institute, based in Ithaca, New York. Contact us at info@eyesonalz.com. The Human Computation Institute is a nonprofit innovation center dedicated to the betterment of society through novel methods leveraging the complementary strengths of networked humans and machines. 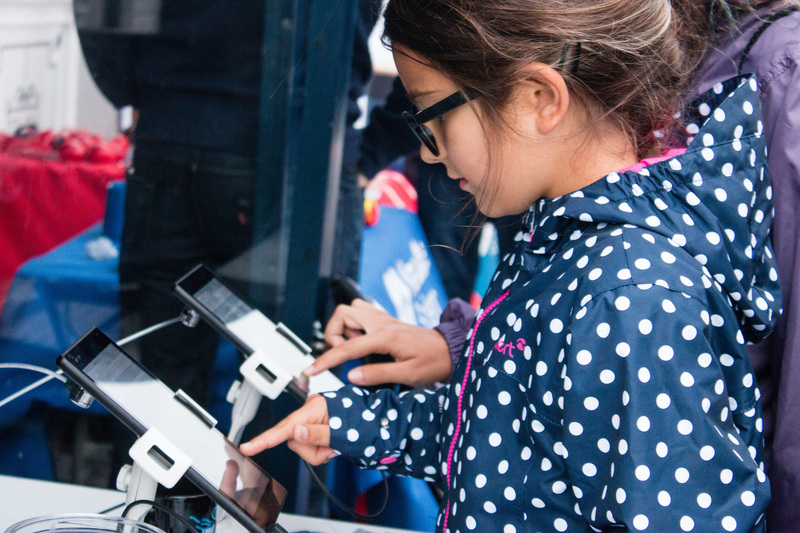 Stall Catchers strives to eradicate Alzheimer's disease by engineering a sustainable participatory systems which could have a profound impact on Alzheimer's research.